Create the dsp.IFFT object and set its properties. ift = dsp.IFFT returns an IFFT object, ift, that computes the IDFT of a column vector or N-D array. For column vectors or N-D arrays, the IFFT object computes the IDFT along the first dimension of the array. If the input is a row vector, the IFFT object computes a row of single-sample IDFTs and issues a warning. ift = dsp.IFFT(Name,Value) returns an IFFT object, ift, with each property set to the specified value. Enclose each property name in single quotes. Unspecified properties have default values. Specify the implementation used for the FFT as Auto, Radix-2, or FFTW. When you set this property to Radix-2, the FFT length must be a power of two. Set this property to true if the order of Fourier transformed input elements to the IFFT object are in bit-reversed order. The default is false, which denotes linear ordering. This property applies only when the FFTLengthSource property is Auto. Set this property to true if the input is conjugate symmetric to yield real-valued outputs. The discrete Fourier transform of a real valued sequence is conjugate symmetric, and setting this property to true optimizes the IDFT computation method. Setting this property to false for conjugate symmetric inputs may result in complex output values with nonzero imaginary parts. This occurs due to rounding errors. Setting this property to true for nonconjugate symmetric inputs results in invalid outputs. Specify whether to divide the IFFT output by the FFT length. The default is true and each element of the output is divided by the FFT length. Specify how to determine the FFT length as Auto or Property. When you set this property to Auto, the FFT length equals the number of rows of the input signal. This property applies only when both the BitReversedInput and ConjugateSymmetricInput properties are false. Specify the FFT length as an integer greater than or equal to 2. The input is a fixed-point data type. The FFTImplementation property is Radix-2. This property applies when you set the BitReversedInput and ConjugateSymmetricInput properties to false, and the FFTLengthSource property to 'Property'. Wrap input data when FFTLength is shorter than input length. If this property is set to true, modulo-length data wrapping occurs before the FFT operation, given FFTLength is shorter than the input length. If this property is set to false, truncation of the input data to the FFTLength occurs before the FFT operation. Specify the overflow action as Wrap or Saturate. Specify the sine table data type as Same word length as input or Custom. Specify the sine table fixed-point type as an unscaled numerictype object with a Signedness of Auto. This property applies when you set the SineTableDataType property to Custom. Specify the product data type as Full precision, Same as input, or Custom. This property applies when you set the ProductDataType property to Custom. Specify the accumulator data type as Full precision, Same as input, Same as product, or Custom. This property applies when you set the AccumulatorDataType property to Custom. Specify the output data type as Full precision, Same as input, or Custom. This property applies when you set the OutputDataType property to Custom. y = ift(x) computes the inverse discrete Fourier transform (IDFT) , y, of the input x along the first dimension of x. Data input, specified as a vector, matrix, or N-D array. When the FFTLengthSource property is Auto, the length of x along the first dimension must be a positive integer power of two. When the FFTLengthSource property is 'Property', the length of x along the first dimension can be any positive integer and the FFTLength property must be a positive integer power of two. Variable-size input signals are only supported when the FFTLengthSource property is set to 'Auto'. 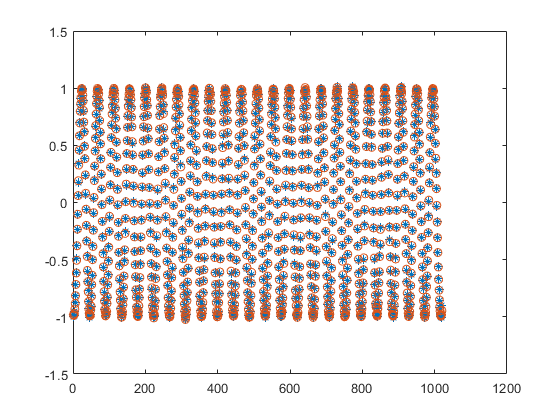 Inverse discrete Fourier transform of input signal, returned as a vector, matrix, or N-D array. When FFTLengthSource property is set to 'Auto', the FFT length is same as the number of rows in the input signal. When FFTLengthSource property is set to 'Property', the FFT length is specified through the FFTLength property. Compute the FFT of a noisy sinusoidal input signal. The energy of the signal is stored as the magnitude square of the FFT coefficients. Determine the FFT coefficients which occupy 99.99% of the signal energy and reconstruct the time-domain signal by taking the IFFT of these coefficients. Compare the reconstructed signal with the original signal. Note: If you are using R2016a or an earlier release, replace each call to the object with the equivalent step syntax. For example, obj(x) becomes step(obj(x)). According to Parseval's theorem, the total energy of the signal in time or frequency-domain is the same. Initialize a dsp.SineWave System object to generate a sine wave sampled at 44.1 kHz and has a frequency of 1000 Hz. Construct a dsp.FFT and dsp.IFFT objects to compute the FFT and the IFFT of the input signal. The 'FFTLengthSource' property of each of these transform objects is set to 'Auto'. The FFT length is hence considered as the input frame size. The input frame size in this example is 1020, which is not a power of 2, so select the 'FFTImplementation' as 'FFTW'. Stream in the noisy input signal. Compute the FFT of each frame and determine the coefficients that constitute 99.99% energy of the signal. Take IFFT of these coefficients to reconstruct the time-domain signal. The signal is reconstructed efficiently using these coefficients. If you compare the last frame of the reconstructed signal with the original time-domain signal, you can see that the difference is very small and the plots match closely. This object implements the algorithm, inputs, and outputs described on the IFFT block reference page. The object properties correspond to the block parameters, except the Output sampling mode parameter is not supported by dsp.IFFT. Frigo, M. and S. G. Johnson, “FFTW: An Adaptive Software Architecture for the FFT,” Proceedings of the International Conference on Acoustics, Speech, and Signal Processing, Vol. 3, 1998, pp. 1381-1384. FFTImplementation is set to 'FFTW'. FFTImplementation is set to 'Auto', FFTLengthSource is set to 'Property', and FFTLength is not a power of two. Use the packNGo function to package the code generated from this System object and all the relevant files in a compressed zip file. Using this zip file, you can relocate, unpack, and rebuild your project in another development environment where MATLAB is not installed. For more details, see How To Run a Generated Executable Outside MATLAB. When the FFT length is a power of two, you can generate standalone C and C++ code from this System object.